'Tis the season to travel, beach-bum, and party non-stop, and we know you girls are so psyched to shop and dress up for Summer 2012. We Cosmo chicks know that we don't need to splurge on expensive wardrobe to update our look with trendy pieces. When shopping for a new season, we know the best place to hit is our friendly neighborhood department store, like SM. To know what you'll find there, check out the latest ladies' collection SM Department Store recently presented on Philippine Fashion Week Spring/Summer 2012. 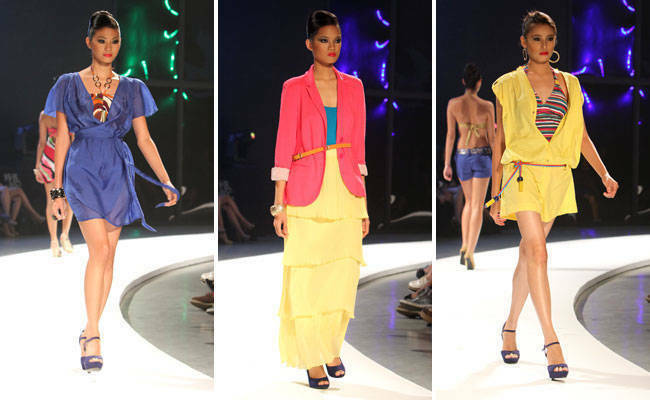 At the runway show held at SMX, SM Ladies' Fashion introduced three key summer trends: bright jewel tones, print, and sparkle. This season is about brights, brights, brights--sometimes with sheen! Add some color to your everyday look or dare to rock the color-blocking trend (yes, it's still oh-so-hot). Hint: Orange is the season's hottest color. So if you’re hesitant to experiment with too many bright pieces, just add some tangerine accents or accessories to your basic, comfy outfit and you're instantly summer ready. Prints can be tricky. So, whether you go for subtle prints or extreme geometric patterns, just be sure you choose the right print that would look good on you (read: you must look trendy, not tacky). The key to wearing prints is pairing it with a solid-colored piece that matches any of the colors on your printed outfit. Just because it’s summer doesn’t mean you can’t go out in sparkylicious outfits! Recall '70s glam and go back to Coco Banana days when fashionistas wore fancy fabrics with glitters and lots of sequins. Tip: Complement your summer looks with the right accessories, and get your shoe and bag fix--on a budget--from Parisian. The summer shoe collection of SM's in-house brand includes wedges, booties, pumps, and strappy heels that go well with the summer trends above and would satisfy the edgy chick, outdoor gal, and classy lady. Their pretty bags--everything from handbags to clutches--will also match every girl’s taste and needs. Check out the summer collection of SM Ladies' Fashion when you launch this gallery.